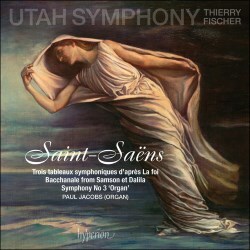 I have not heard any other version of this work, but from following the score and listening to this recording it strikes me that Thierry Fischer and his Utah Symphony make a very good case for the piece. In fact, I would say it is the main reason to buy the disc since both the more familiar pieces included here are well-played without displacing previously favoured versions. These are all performances recorded live in concert. According to the Utah Symphony's own website this is the first of three such discs from Hyperion which will include all the Saint-Saëns Symphonies - apparently the first time an American Orchestra will have recorded this repertoire. Returning to these Trois tableaux symphoniques, I have to say my impression is that they are more symphonic than dramatic. Nicholls points out one brief passage of dialogue which part of this music originally underscored but this seems to be stronger on general mood and atmosphere than pointing fast-moving drama. Another thing that the ear detects and the eye following the score confirms is the economy of Saint-Saëns' writing. This might be an imperative born of churning out extended incidental music and/or a consequence of his advancing years, but this is not a thickly scored work full of dense counterpoint. Indeed the full brass is held in reserve for the main climaxes and the wind writing is relatively simple with pairs of instruments often playing in thirds. The middle movement is beautifully atmospheric, with the quality of the Utah wind principles to the fore. The previously mentioned harmonium is very well caught by the Hyperion recording and sounds far more in tune and equal toned than most such instruments I have ever encountered. The recording throughout is very good. I must admit to not realising that the Abravanel Hall in Salt Lake City has quite the resonance and acoustic overhang that it exhibits here. Engineer Tim Handley tames the acoustic very effectively, allowing it to add bloom and power to the climaxes while retaining crisp detail from the inner writing. Given the music's relative simplicity in a contrapuntal/homophonic sense this works well in these tableaux. I am not sure the textural complexities of the Symphony respond so well. The closing Allegro moderato e maestoso has a suitably ceremonial and rather grandiose atmosphere - you can easily imagine some ancient ceremonial march. Fischer paces the movement well, building to a suitably powerful indeed cinematic climax. Some sense of the acoustic of the hall can be heard after the end of the first and third movements - the hall sounds positively cavernous - I see the Abravanel Hall website states a capacity of 2811 so it is very big! Before the symphony there is another popular Saint-Saëns orchestral work - the Bacchanale from his most famous opera Samson et Dalila. A bit like really funny jokes, I am not sure classical music does orgies very well! In the opera house this section is nearly always a moment to "look away now" while the chorus and ensemble do their best to appear transported in ecstasy. Here, the playing of the orchestra is again a delight - from the sinuous oboe solo which opens the work, through all the tricky little string figurations right up to the closing denouement. A problem that is purely my own is that in the closing two minutes or so the persistent use of castanets and the rhythm they play strikes me as sounding more like Roy Rogers galloping than consuming passion! But joking aside, I find Fischer to be just a little literal in the sensually swaying rhythms of the piece. Played with exemplary precision but not enough allure. As I was starting to write this review I read of the death of the great British organist Noel Rawsthorne. For anyone who has an interest in the British and indeed international Cathedral and Concert organ scene Rawsthorne was a colossus. He was organist at Liverpool's Anglican Cathedral with its mighty instrument for many years and it was he playing the 'title' role in Saint-Saëns' Symphony No.3 'Organ' when I heard it for the very first time in concert in the Philharmonic Hall in Liverpool sometime in the mid-70s. Of course, the truth is that any modestly able organist can play the 'solo' part in this work pretty much at sight - the contribution of the piano duettists is far more demanding. But the presence of a powerful organ does crown this thrillingly Romantic work to stunning effect. Over the years this has become an audiophile test-piece for engineers and sound systems and as a consequence there are literally dozens of versions to choose from. By that measure, this new version - with Paul Jacobs getting the glory as the named organist - is very good, sonically impressive - but without the musical or interpretative individualism to stand it apart or indeed above the crowd. Referencing Rawsthorne in Liverpool, I chose to use his recording - made in the Anglican Cathedral with the RLPO under Loris Tjeknavorian - as one of my comparisons. Throughout Fischer's performance I feel that he emphasises precision and poise at the expense of inherent drama. Take the opening of the third movement Presto - in pure executional terms this is a delight, the string figures bound along with springing brilliance. Nearly every other version I know - although all at remarkably similar tempi - get the strings to 'dig in'. Likewise in the first movement, when the main theme returns in the low wind and horns over anxious string figurations [Letter N in the study score - 7:27 track 5] it is marked sempre ff in all parts rising to fff 14 bars later. Again, the execution is wonderfully accurate – but musicians playing for their lives it is not. Although the organ contributes in the slow movement too, it is the 'big reveal' at the beginning of the finale that defines its contribution to the work. The Tjeknavorian recording fights a losing battle against the massive cathedral acoustic throughout but it almost is worth it for that chord from the organ. The Utah organ - all the better for being recorded in the same hall at the same time - is palpably not as mighty an instrument but it is still an arresting moment. Interesting to make a direct comparison with the Utah SO's other recording from 1994 on the old Dorian label with Eduardo Mata conducting and Jean Guillou on the organ. I think the older recording was made in the Meyerson Centre - I prefer the organ there to the one used in the Abravanel Hall as well as preferring Mata's greater drive and sense of drama. On similar lines I prefer the famous - if now rather old-sounding - Charles Munch/Boston SO recording on RCA and indeed Maazel in Pittsburgh on Sony when that company were exploring again simple 2 microphone set-ups . From the various websites I cannot tell if there is a permanent instrument in the Abravanel hall or whether something was rigged up for this recording. As mentioned, Tim Handley and the Hyperion production team make a very good job throughout of this standard format CD - no SACD or multi-channel options. I can imagine Fischer's slightly 'classical' approach paying greater dividends in the earlier symphonies which will constitute the rest of this mini-series. For the moment, judging by this disc alone it is a worthy rather than remarkable addition to the symphony catalogue. The Tableaux are the reason to hear this recording.